There is starting to be a nip in the air and some of us even have snow. Fall is almost here. So,as it comes time for your next pedicure and manicure and you want to feel cozy on your feet…TRY these if you please! 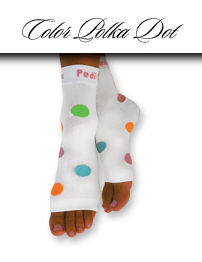 The one and only original Pedi-Sox! They even have a lotion that you can use or use your favorite body lotion that you apply on your feet for softer skin and to soothe those dry calluses. * I like to use coconut or almond oil on my feet before I apply my nail polish too. The extra thick SOX material make them comfortable to even walk in…alone or in sandals. You or your nail tech slips on these Pedi-Sox BEFORE you paint your toenails.Feet stay comfy and cozy and above all clean! I use them especially in the fall and winter but you can use them year round.I just found out they come in 27 fashionable Pedi-Sox styles. Make your beauty regime fun and soles hydrated and clean with these.